Special-edition Peugeot 4007 on sale | What Car? 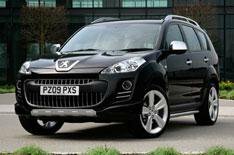 Peugeot has added a Sport XS special edition model to its 4007 SUV range. Extra equipment over the entry-level SE model includes 18-inch alloy wheels and a styling kit that adds front and rear spoilers as well as chrome side bars, door mirror covers, door handles and exhaust tailpipe trim. Leather upholstery and sports front seats are included in the cabin but, unlike other 4007 models, the Sport XS has just five seats. Power comes from the same 154bhp diesel engine that powers the rest of the range. At 24,695 the Sport XS commands a 1450 premium over the SE model, but costs 1150 less than the top-spec GT version.